Per his military service record (regimental no. 4830), Samuel Henry Luke was born at St. Marys, N.S.W. He gave his age as 38 years and 11 months, his marital status as single, and his occupation as Laborer. His description on his medical was height 5 feet 8 inches tall, weight 154 lbs., with a medium complexion, brown eyes, and brown hair. His religious denomination was Church of England. He claimed that he had no previous military service. He completed his medical on the 11th November, 1915 at Ashfield, and was attested at Ashfield on the 11th November, 1915. However, according to the Nepean Times (13/11/1915, p. 6), he joined the Coo-ees on Wednesday 10th November 1915, when they were at St. Marys. On his embarkation roll his address at time of enrolment was St. Marys, near Penrith, N.S.W., and his next of kin is listed as brother, J. Luke, St. Marys, near Penrith, N.S.W. On 8th March 1916, Private Luke departed Sydney on the HMAT Star of England, arriving in Egypt on the 11th April 1916. He was sent to the 4th Training Battalion at Tel El Kebir, Egypt where he trained until the 25th of April 1916 and was transferred to the 4th Pioneer Battalion at Serapeum, Egypt being taken on strength on the 29th of April 1916. On 4th June 1916 Private Luke left Alexandria aboard the Transport Scotian bound for France, arriving at Marseilles on 11th June 1916. 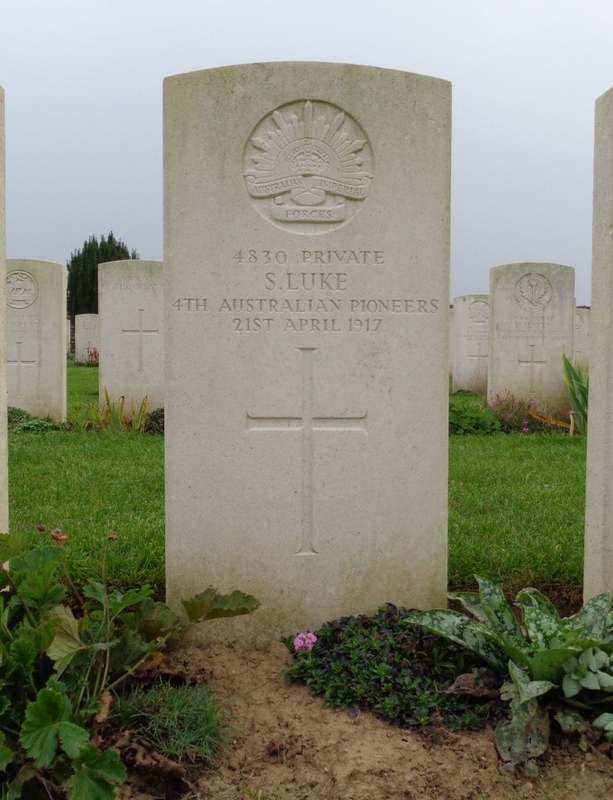 Private Luke served with the 4th Pioneer Battalion throughout its service on the Western Front including Pozieres in August 1916, Mouquet Farm in September 1916, and Flers in October 1916. On 21st April 1917 during the First Battle of Bullecourt the 4th Pioneer Battalion was constructing tramways in the vicinity of Vaulx–Vraucourt, France when Private Luke was killed in action by a high explosive shell. He was buried in the Vaulx Hill Cemetery, France. Private Luke’s name is commemorated on panel 174 on the Australian War Memorial First World War Roll of Honour. Private Luke’s name is also listed on the St. Marys War Memorial. 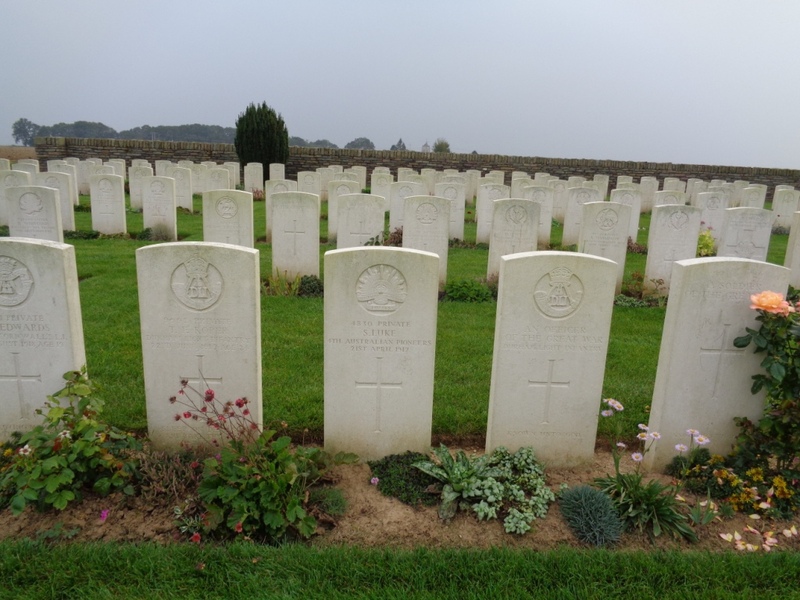 On 6th September 2014 Stephen and I drove to Vaulx Hill Cemetery, which is located near the village of Vaulx-Vraucaourt in France, 6 km north-east of Baupaume. According to the Commonwealth War Graves Commission website http://www.cwgc.org/, Vaulx Hill Cemetery started in September 1918, and further graves were added after the Armistice from the nearby battlefields. There are 856 Commonwealth soldiers either buried or commemorated in this cemetery. Samuel Luke, a labourer on enlistment per his service record, who joined the Coo-ees at St. Marys, is the only Coo-ee buried in this cemetery. He was killed in action on 21st April 1917. The photograph below shows Samuel Luke’s grave (centre) at Vaulx Hill Cemetery. A photograph of the headstone on Samuel Luke’s grave will be placed on his individual blog entry, and form part of a Roll of Honour for the fallen Coo-ees on this blog.